On Wednesday morning, snow is winding down and totals range from 2-15+ inches (details below). Look for drier weather Wednesday afternoon, then expect three additional storms on Thursday, Saturday, and Monday. Each of these systems will favor the northern mountains though all areas could get some snow. Good news all around! The snow that fell from Tuesday morning through Wednesday morning and left varied totals across Colorado. My forecast yesterday was 4-8 inches west of the divide and 8-15 inches near and east of the divide. The areas west of the divide were generally within range and most areas east of the divide were at or below the low end of the range, and there (of course) were some outliers. Most resorts are not open and thus not reporting snow, so we need to engage in a bit of detective work to figure out snow totals. Below is the list I compiled based on snow stake cams as well as SNOTEL backcountry weather stations. Most models agreed that the southeast mountains would get the most and indeed the SNOTEL stations are snowing by far the most snow (10-15”+) in this area. 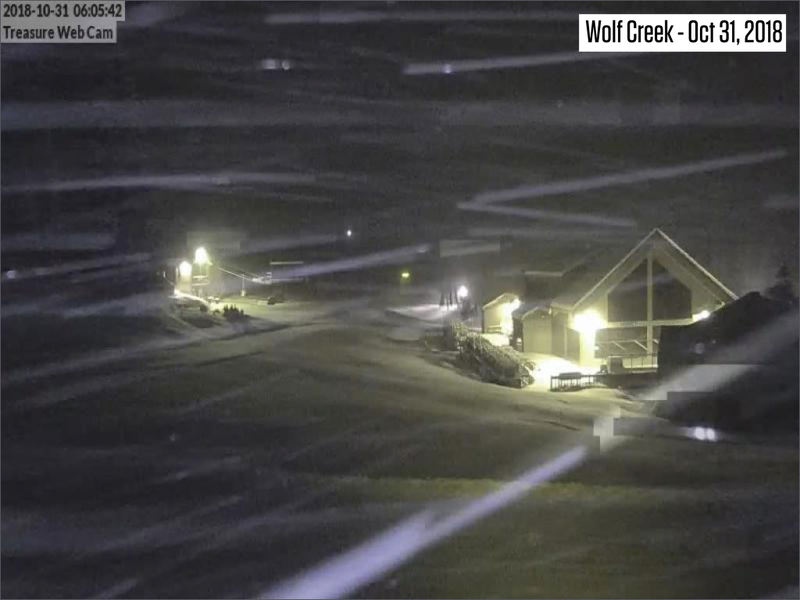 Wolf Creek came late to the party with snow not starting until Tuesday evening, and they were right on the edge of the forecast showing the area of heaviest snow. Looks like it came through for them (11-12”+ based on SNOTEL) and it’s still snowing. Mountain cam image below from Wednesday at 630 am. 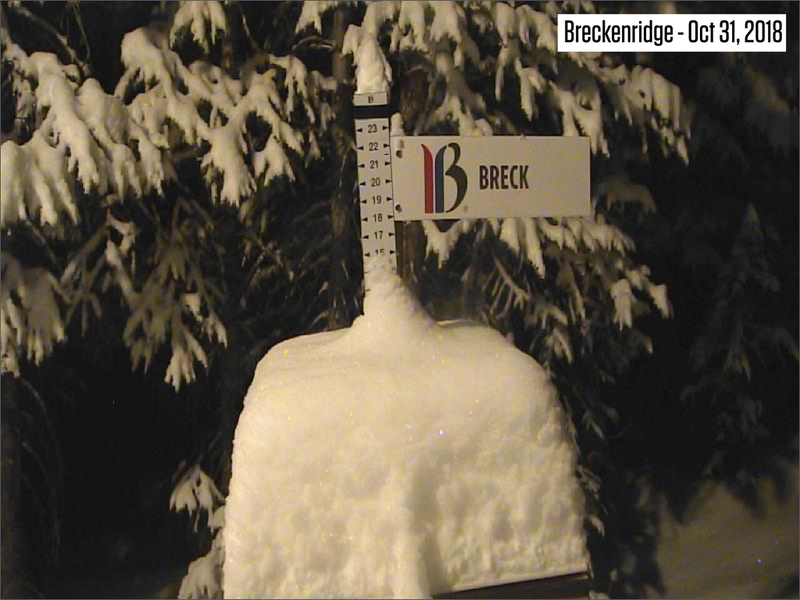 Breckenridge somehow bucked the trend in the northern mountains as their snow stake cam shows 11” while nearby mountains are reporting 4-7 inches. Snow stake cam image from Wednesday at 500 am. Overall it was not a perfect forecast but things worked out reasonably well. When a single storm delivers snow to nearly all mountains across the state, that’s a great scenario. Wednesday. Snow will continue over the southern and southeast mountains through about noon and then it will dissipate. Northern and central mountains should see morning flurries with snow ending. Storm #2 will bring snow showers Wednesday night through Friday morning. The focus will be on the northern mountains with 2-4 inches in on-and-off snow showers and gustier winds. Storm #3 will bring snow from Friday night through Saturday night. This system will again favor the northern mountains, maybe another 2-4 inches or a bit more. While a forecast for 2-4 inches might not sound great, remember that often our best snow conditions during the season come from constant light-to-moderate refreshes. Sure, we all want the 12+ inch powder day, and those are wonderful days, but don’t discount a few inches of snow every 1-3 days as this keeps the snow surface fresh and soft. As of right now only Loveland and Arapahoe Basin are open for full-time operations and Wolf Creek is open on weekends. These are the inbounds spots to get turns. If you head into the backcountry to earn your turns, remember that avalanche risk can exist anytime there is snow on the ground so do not brush this off as early season and lose focus. CAIC (Colorado Avalanche Information Center) will begin daily forecasts on November 1st – they are the best resource for avalanche information! We will be coming off of three storms (Tuesday 10/30, Thursday 11/1, Saturday 11/13) and there are likely at least two more on the horizon. Storm #4 should bring snow from Sunday afternoon through Tuesday morning. This could be the strongest storm of the next three with over 6+ inches of snow for many northern and central mountains, and maybe the southern mountains as well if the storm tracks just a bit further south. Storm #5 is much less certain and could arrive sometime between Friday-Sunday, November 9-11. Still super far out, so I can’t offer more details at this point. Happy Halloween, yea for snow, and thanks for reading! Next update on Thursday, November 1. * New! November 8 in Evergreen at Boone Mountain Sports / Evergreen Brewery. Beer and food available for purchase, and my talk starts at 700pm. Details here. * November 9 in Breckenridge at the Breckenridge Backstage Theater. Party, my talk, and a movie. Time from 500-830pm. Details here. * Wagner Skis launched a podcast with guests like pro skiers Angel Collinson, Tommy Moe, and Chris Davenport, hosted by veteran ski journalist Jason Blevins. Subscribe and/or download the episodes. * I was interviewed a few weeks ago by Aspen Entrepreneurs. If you’re curious about the origin story of OpenSnow, my thoughts on the upcoming winter, and lots of other details about the business and the weather, give it a listen! Go to my episode.